Deb enabled me again. 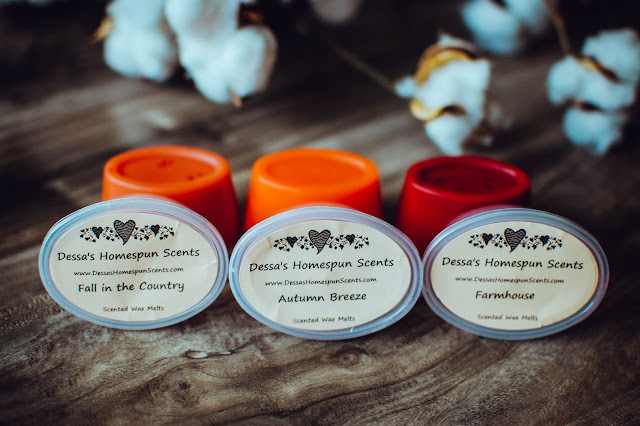 She mentioned buying some fall favorites from Dessa's Homespun Scents and I knew I wanted to grab a few myself. Well... a few turned into "ooo, I want to try this! And this! And this!" 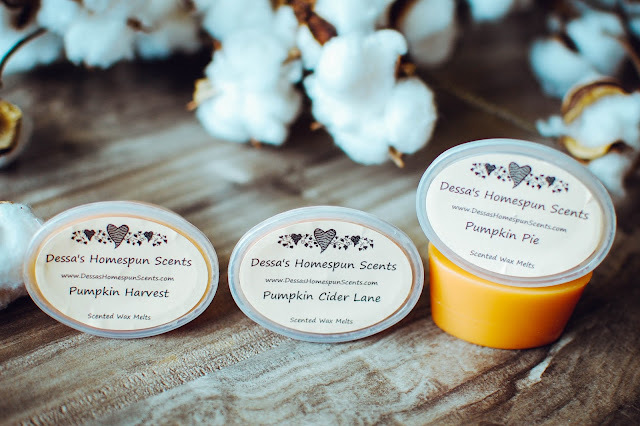 I was in the mood for apples, pumpkins and spice and if there is anything Dessa has an amazing selection of it is fall scents. She will be closed the last two weeks of July for personal reasons but will be open again August 1st. She rarely ever closes, but needed to this time. 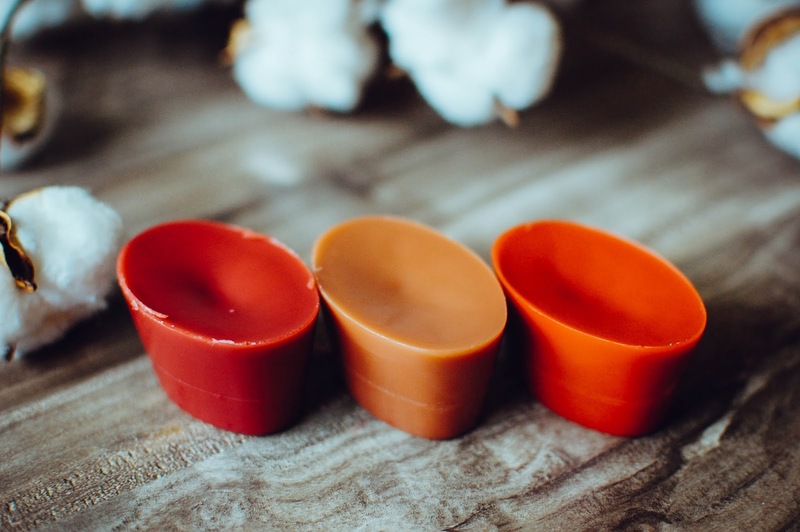 Pumpkin Gingerbread blends pumpkin pie and gingerbread in an original house blend (that is when vendors hand mix fragrance oils to achieve a custom scent rather than just using a straight pre-made fragrance oil). Deb mentioned this being one of her fall must-haves and I can see why. Deeply spiced and rich, the gingerbread is good enough to lure Hansel and Gretel inside. It brims with zippy ginger, peppery nutmeg, licorice hued allspice, fiery cinnamon and star shaped clove. Underlying the decadent gingerbread is caramelized pumpkin. This bag 'o cutie pie punkins weighs 5.2 ounces and cost $5.25. Autumn Campfire brews a cauldron of cinnamon, cloves, pumpkin pie, apples, gingerbread, hot cider and marshmallows roasted over a campfire in another unique house blend. Deb gifted me this scent in the past and I knew I enjoyed it, so I ordered a bag of Mason jar shapes in it, weighing 4.6 ounces at the cost of $5.25. Macintosh apples stand out at the forefront to my nose, followed by mellow spices, and then toasted marshmallows. The campfire does not come off as smoky or acrid, but just woodsy. I thought I remembered this being more fireside and less apple last time, but maybe my memory fails me. Either way it is a pleasant autumnal scent that throws at a healthy medium-strong. Pumpkin Harvest- Notes: Vanilla, pumpkin, cinnamon, clove, nutmeg, creamy milk. I think I may have gotten the wrong scent in this cup. I get a strong spicy zucchini bread vibe. It could be the milk notes but if so they are slightly sour and bready. If you love zucchini you will love this. Pumpkin Cider Lane- Notes: Spicy pumpkin pie and caramel Cider Lane. 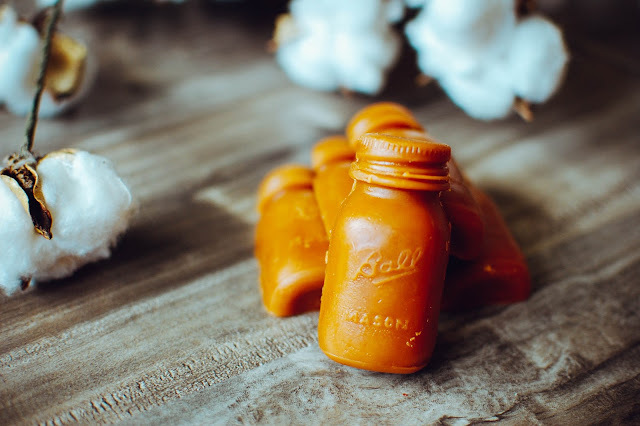 Pumpkin pie spices lend a kick to this creamy sweet caramel dupe of Bath & Body Works Cider Lane. Very nice! Pumpkin Pie- Notes: Pumpkin puree with cinnamon, ginger and cloves baked into a flaky pie crust. The pumpkin reminds me of caramel but heavy with yummy hot cinnamon. Not much on the crust notes but that does not deter me. Apple Pumpkin Streusel- Notes: Homemade apple pie blended with pumpkin ginger streusel. Delicious. A more mellow and smoother version of the Pumpkin Gingerbread. Not as much ginger vim and cinnamon fire. It reminds me of apple cake baked with a touch of ginger and spice. Cinnamon Sugar Fried Apples- Notes: Macintosh apples lightly sprinkled with cinnamon and sugar. Sweet Macintosh apples are the star of this tart. Very soft spice. Apples & Cinnamon- Notes: Fresh apples slices generously topped with spicy ground cinnamon. Sometimes simple is truly best. The apples here have a clarity and nectar like quality that is enhanced with ultra concentrated cinnamon oil. This is one of my favorites. Very spicy and like baked apples. Fall in the Country- Notes: Crisp apple cider, oak, oranges, cinnamon, and clove spice. Dessa mentions in her description that this is similar to Bath & Body Works Leaves scent, but I do feel it is different enough to warrant noting. The apples are more concentrated like a toddy and the spice much more rich and deep. This is one of my favorites of the bunch that feature apples and cinnamon, right behind Apples & Cinnamon. Autumn Breeze- No longer listed on site and no description. I went back to look up the components of this scent and I can no longer see it listed. Not sure if it will be offered again. It smells lovely. Crunchy red leaves, cool earth, curled cinnamon bark and a slight pine infused gust of wind that lifts the ends of your scarf. Farmhouse- Notes: Hot apple cider, zesty mandarin, cloves and spices. Dried orange peels and slightly musty cabin wood with echoes of the spice cupboard wafting out of the primitive kitchen greet the nose. The mandarins hold the intense flavor of a blood orange, dripping red. Really the mandarin holds reign here. Maybe it is a farmhouse in an old orange grove. I like that. Cider Barrel- Notes: Apple cider, warm mulling spices, clove simmered in a wooden barrel. Comforting and cozy. This cider blend is brewed with Honeycrisp apples, Madagascar cinnamon sticks and love. Lightly amber sweetened wood cups impart their aroma to the cider. Mulled Hot Cider- Notes: Macintosh apples and mulling spices. This version is less sweet and spicy as Cider Barrel. It actually has more of the wooden undertones and a slight muskiness. I prefer the vibrant quality of Cider Barrel to this. This Old Cabin- Notes: Spicy hot ginger, warm applesauce, cinnamon and outdoor pine. Memories of cabin living in the Smoky Mountains float to the front of my mind when I sniff this. The pine note holds more bark than green needle and jives wonderfully with the sweet apple tones. Not very spicy at all, more of a subtle depth. Harvest Moon- Notes: Nutmeg and cinnamon sticks, applewood and cedar, a Bath & Body Works Autumn Night dupe. Yum! 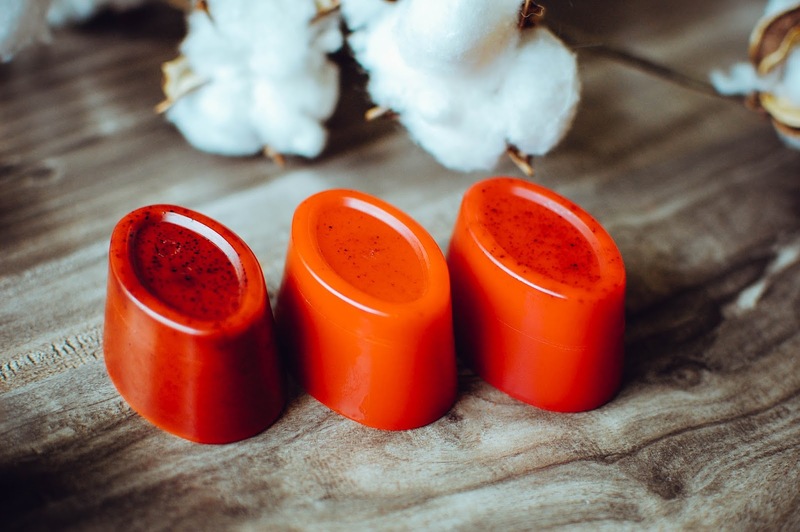 That applewood smells like apples and rosewood with a hint of dry cedar bark, the spices are kept to a minimum but there is a sweet amber nectar threaded throughout. I need more of this. October- Notes: Apple cider, caramel, pumpkin pie, cinnamon and cloves. The caramel makes this a nicely unique scent. 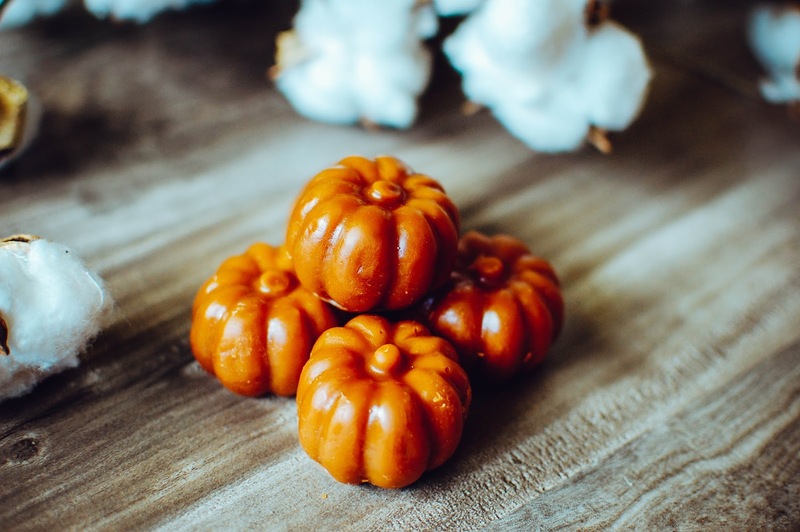 It does evoke October, bubbling with caramel candies and spicy apple cider. The pumpkin pie lies a little dormant. Another scent I would buy again. Haunted Hayride- Notes: Hay, leaves, Macintosh apples and cinnamon. This one reminds me of Bath and Body Works Leaves scent, but blended with sweet hay and earth and watery apples fresh from the bobbing trough. Cinnamon Broomstick- Notes: Crushed cinnamon sticks and a hint of fresh clove. Pure sweet cinnamon oil saturating the twiggy broomsticks that herald fall. I buy one or two every year and this tart smells just like them. Amazing. Honey Glazed Gingerbread- Notes: Gingerbread with clove, ginger, cardamom, cinnamon, nutmeg and vanilla, topped with honey glaze. This scent is one of my top bakery fragrances. Buttery moist gingerbread baked with extra pinches of aromatic spices and the sweetness of honey drenching the cakey bread. Cranberry Spice- Notes: Tart cranberries accented with cinnamon and spice. I am terribly picky about my cranberry scents. Too artificial, too candy, too tart and I am out. But Dessa's Cranberry Spice is a keeper. A holy grail spiced cranberry. Plump burgundy fruit equally tart and sweet with a perfect amount of cinnamon sugar. Country Christmas- Notes: Clove, apple, cinnamon and oranges. A dupe of Gold Canyon's Cozy Christmas. Red hots! Atomic Fireballs! Blazing hot, fiery cinnamon! I love it. Love love love it. Main Street Christmas- Notes: Tart cranberries, bayberry, cinnamon, orange zest, and freshly cut pines. A beautifully complex scent where spiced cranberries garnish a wreath of camphorous bayberry and sweet honeyed citrus swirls about. Not overly spicy and nicely sugared. Almost apple enhanced as well. An excellently balanced fragrance that will bring the holidays into your home. Cinnamon Garland- Notes: Bayberry and spicy cinnamon. A favorite. Slightly piney and robust bayberry mingles with pungent cinnamon to make my spice loving heart pound. The free samples, so sweet! 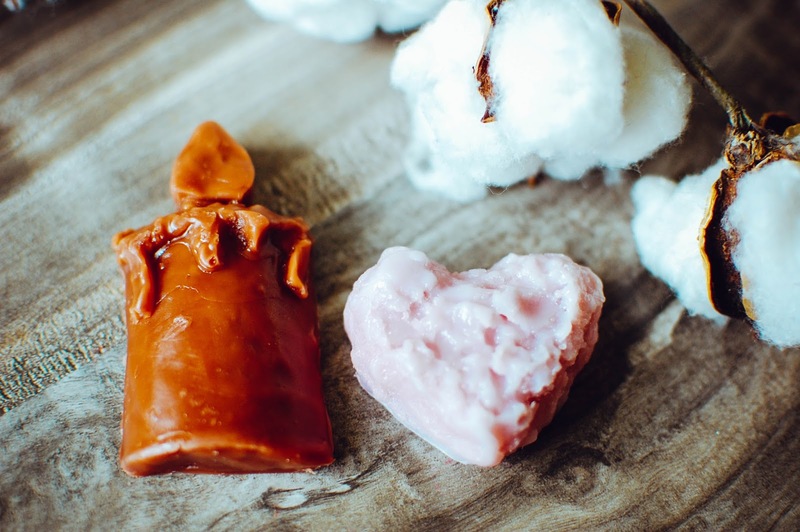 Coffee & Donuts- I mostly get the puppy paw bitter coffee scent I am accustomed to but with a touch of cinnamon. Smoky Mountain Berries- I LOVE this one! It smells like cranberries, apples, bayberry and evergreens. A wistfully nostalgic Christmas scent! And I quite love this tart shape. Rootbeer Float- Yep. That molasses, rooty and oh so sweet syrupy scent of rootbeer. Country Store- This was supposed to be another quintessential apple and spice scent but smells a bit more mellow than that. It melted strong in my bedroom and smelled like cozy fall bliss. In fact, when Savanna strode into my bedroom she said "It smells like fall in here!" As usual, I love my Dessa's order. 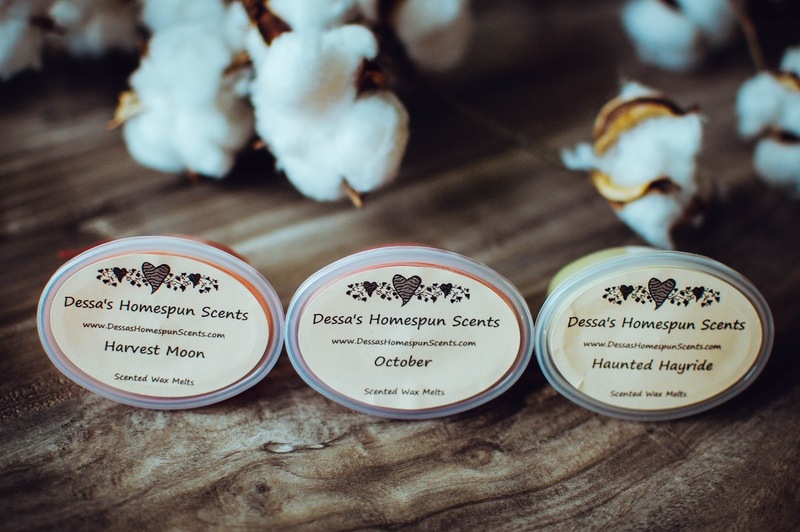 If you have a hankering for fall scents you can't go wrong with Dessa's Homespun Scents. She recently had a 4th of July sale and I picked out a handful of scents. 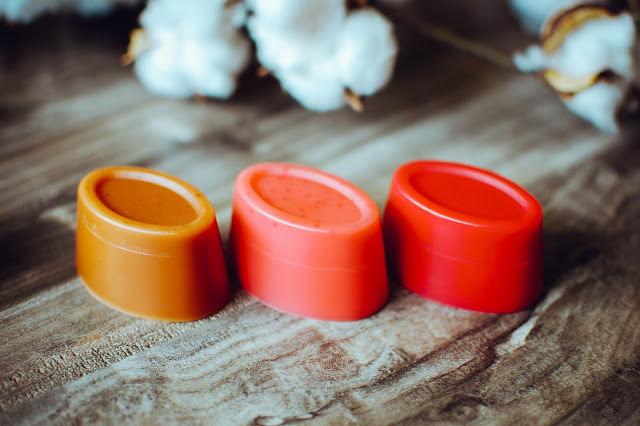 She is also working on releasing more autumn and holiday scents in August (I requested cedarwood and spice blend I think she might try to make! Woot!). Her TAT (turn around time) is fast. Less than a week. 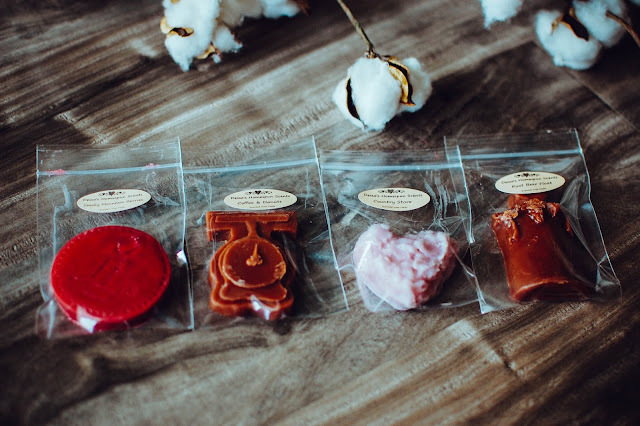 Any scent and shape can be ordered as well as custom blending. Shipping was $10.77. 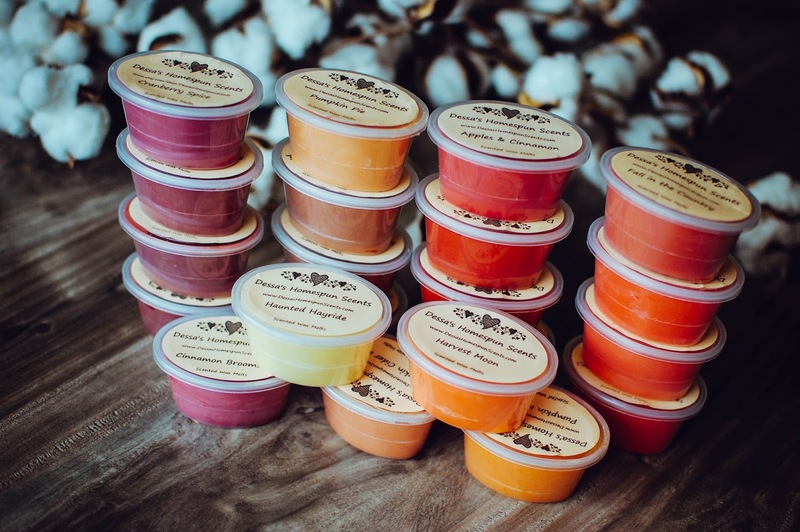 Have you begun stocking up for the fall and winter? 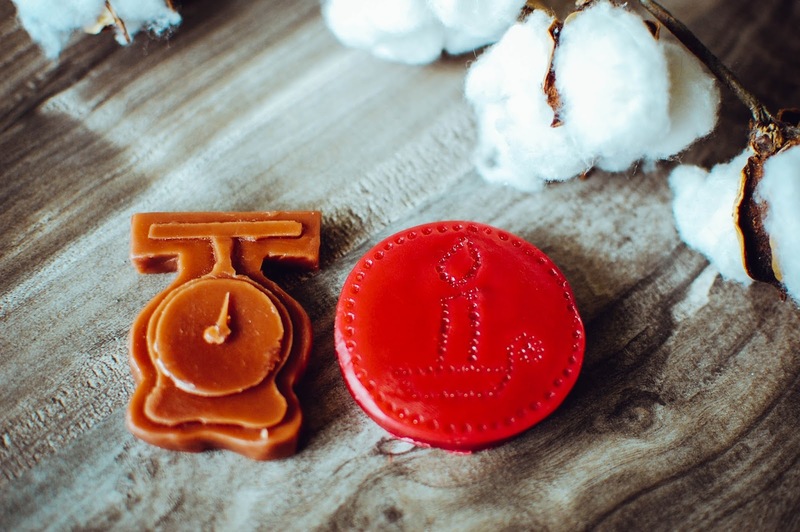 Are you a seasonal melter? Spice hater or spice lover? I just CAN'T think about fall scents when it's over 100 degrees in mid-July!! However, these are obviously 'Must Haves'. 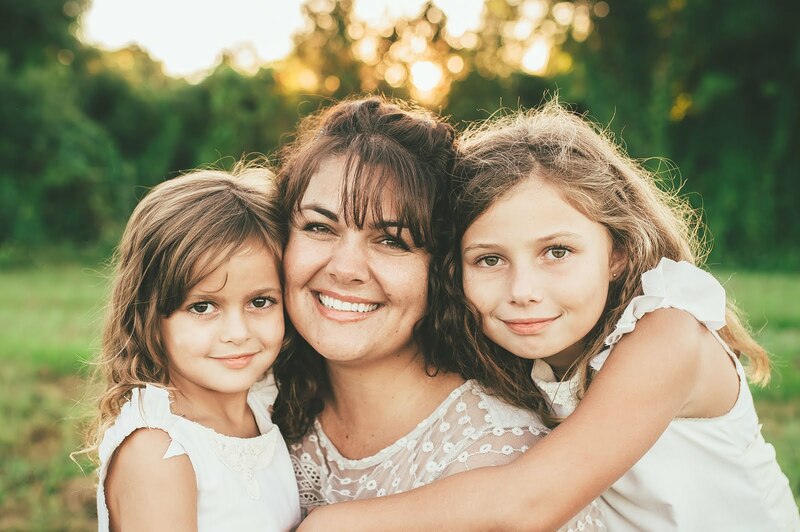 If both Deb and Julie love their Dessa's....so will I!! Great reviews as always, Julie! Lol!! We are blazing hot for sure in FL right now. I am always a season ahead when it comes to buying scents. I like to be stockpiled and ready to go once the season hits. I am way too much of a planner. Lol! Thank you Kevin for your kind words! Deb totally enabled me too. Lol! Good to know I am not the only one who likes to buy a season ahead. I won't melt (other than testing) until fall but I like to have them well ahead of time. 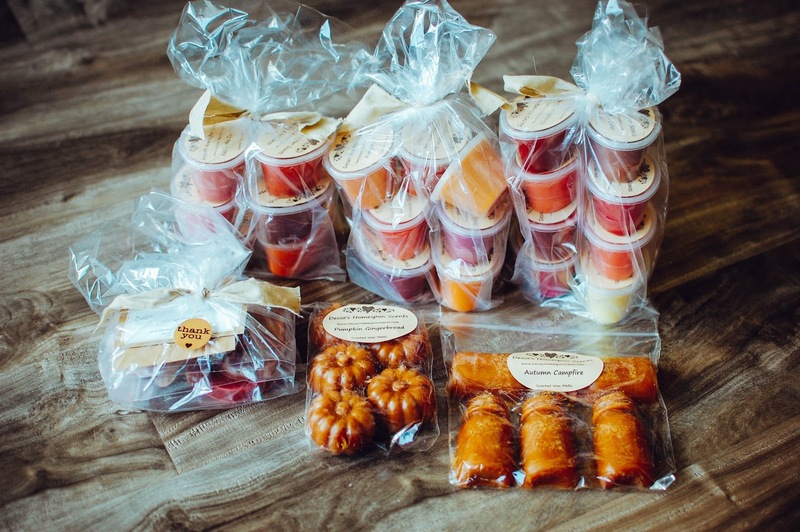 Dessa has AMAZING fall scents and selection. I am really wanting to build up a nice fall and Christmas stockpile. 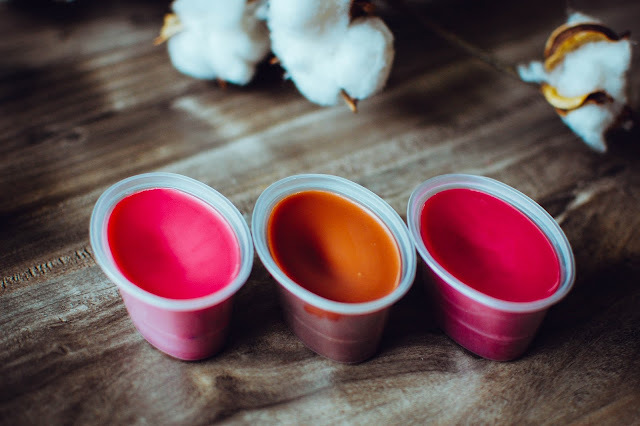 Dessa's is definitely on my list of vendors to order from as I have only placed one small order from her earlier this year and her scent list is awesome!! Thank you Leah! That means a lot to me! I agree, Dessa's scent list is pretty incredible. If you live spice she is your vendor and I LOVE spice. I do need to place an order for some of her new fall and holiday scents soon.